Disneynature’s BEARS in Theatres April 18th & CONTEST! Disneynature BEARS Comes to Theatres April 18th! Disneynature’s new True Life Adventure BEARS chronicles one year in the life of two mother bears, set in the Alaskan wilderness. As they teach their young cubs life lessons, the world is an exciting, but dangerous, playground. The bears face threats like avalanches, wolf packs, and predators. The brown bears must forge together to find food—and a feast of salmon is their reward. BEARS captures the essence of one of the planet’s last great wildernesses, where mothers know best and their cubs’ survival depends upon family unity. Directors: Alastair Fothergill (“Earth,” “African Cats” and “Chimpanzee”) and Keith Scholey (“African Cats”). 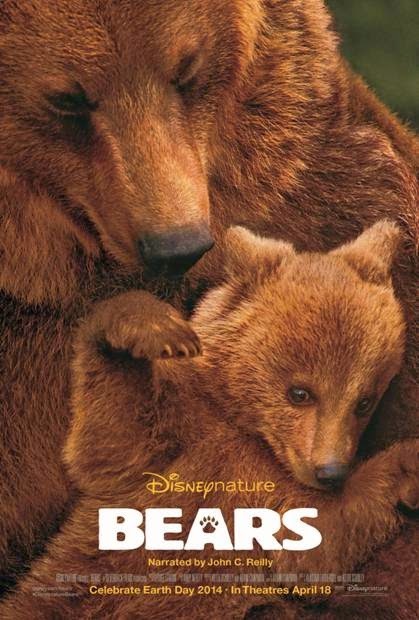 BEARS debuts in theatres on April 18, 2014, in celebration of Earth Day! WIN Family Passes (of 4) to see an advance screening of Disneynature BEARS from Snymed.com! I have six (6) family passes to give away, two (2) per eligible Canadian city (Toronto, Calgary & Vancouver). Advance screenings are on Saturday April 12th, 2014 at 10:00am. See contest form for theatre locations. Contest closes on Monday April 7th, 2014. Leave a COMMENT below stating if you've ever seen come face-to-face with a wild bear OR let me know your favourite wild animal. Then, use the entry form below to enter the contest. GOOD LUCK! I love that question. Now I want to come back and read the comments!! Ive never seen a bear in the wild. Def wanna see this! But not close enough to enter the contest. so passin on this one. I have seen a bear but not too close ! I actually ran into a bear while hiking with my wife several years ago in Kootenay National Park (South of Banff). We were about 10 kms in when we came upon a large Grizzle Bear about 100 feet away. Luckily it turned and ran instead of charging and once we stopped shaking we realized what an awesome experience it was. Can't wait to see this movie (with our kids) as we have now become to love everything Bear! We see them at the cottage every so often! One ate a hole through our shed door last year! Have come close to a bear, but not too close! Nope, haven't come close to a bear.... thx! Yes, we came face to face with a mama bear and her cubs at Whistler - it was quite scary, as she was in full protective mode of her babies!! I saw a polar bear in the Toronto Zoo and a black bear in the Philippines but not the brown or panda bear. I read about the brown and polar bears online and learned that the polar bears are having a hard time surviving as a result of people's activities that affect them. I also watched an American who befriended brown and black bears near Alaska though not everyone appreciated the bears coming in their community. I saw a polar bear in the Toronto Zoo and a black bear in the Philippines but never a brown bear. I also learned more online from bears.org & Wikipedia so I know that the polar bears are endangered species. They're also descended from the brown bears. An American man befriended brown and black bears in his cottage somewhere near Alaska but his neighbours are not so pleased that bears are in their community. I think he's stopped it as he's already old to deal with the bears as they are stronger than him and he once lost consciousness after a bear swiped him with a paw. I both respect and admire these bears in the wild as they are very intelligent, but also unpredictable at times. Aisu, I remember seeing the polar bears at the Toronto Zoo too and it was beautiful to watch the bears swim. I have seen brown bear momma and cubs in former Yugoslavia ... but from a far ... we stayed away from them they are dangerous even though they are interesting to look at. I do like polar bears a lot. What an incredible experience! Thanks for sharing it! I would love to learn more about bears. Nice movie. Our Winter Barbecue During March Break!